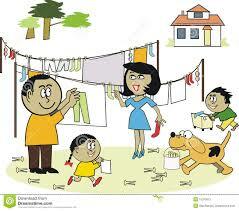 Who does which chores in your house? Are they equally apportioned? Shared? How do you figure out who does what? For which chores is a special “thank you” required? Have any chores been reassigned over time? Some people have solved the challenge of household chores by not doing them at all, especially dusting. The ensuing sneezing is viewed as a kind of liberation. How big a factor are chores in your feminism score?